One of the things I love about photographing people is that I’m invited to take part in some of life’s most amazing moments—and every once in a while, an event comes along that feels so intimate and special, that I can’t believe I’m lucky enough be a part of it. That’s exactly how I felt while taking photos at Poorva’s traditional Indian baby shower. From the moment Poorva’s husband, Rishi, greeted me at the door, I felt like I was part of this vibrant, cultural baby shower. The house smelled of mouth-watering spices and the kitchen counters were lined with numerous unknown dishes. In the corner of the living room, a large, plush chair had been transformed into an ethereal swing-looking perch. Tulsi, a mutual friend, helped me navigate through the traditions at the party—making sure I wouldn’t miss a single important moment.. She explained how today was to be a day of pampering for the mom-to-be. They would braid flowers in to her hair and feed her sweets, all while honoring and blessing the life she was nurturing inside her. The men and children waited in the living room, while the women readied Poorva in the bedroom, tying on floral garlands. Poorva’s mother took a quiet moment to bless a small tray that would be used to bless her daughter. Each part of the shower seemed full of meaning. Poorva wore a gorgeous green Sari, to represent a connection to Mother Earth. Five married women gave her a blessing, putting different spices on her forehead and in her hair. Her husband fed her a sweet-- something she said she has been craving, but not eating much of during her pregnancy. I love this photo! There's something so tender about a mother passing on her blessing to her daughter, who is about to become a mother too. I love the way this photo represents that bond and how Poorva is still looking up to her mother. 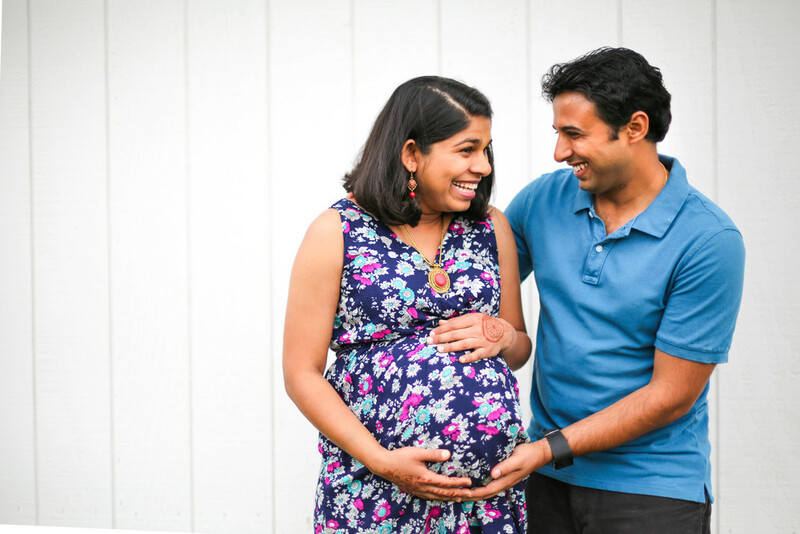 Tulsi and her husband, Samir. I like to talk to my couples as I'm clicking away, because I think it eases tension. This is the adorable face Poorva made when I said, "Just think! Soon there will be three people in your family photos!" There are so many more photos from this gorgeous day, and unfortunately this just has to be a little teaser for now! More photos to come-- and I'm so excited for this little family!